This report displays all Progress Notes created during date range defined, and shows (1) if note has been signed and (2) if note has been linked to an appointment. It helps you to quickly identify existing progress notes that need attention (signatures or link to an appointment for insurance claim submission). 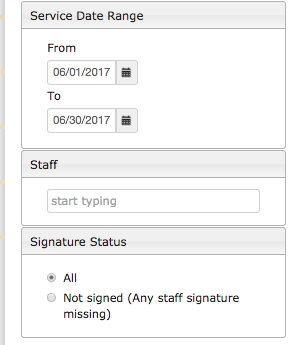 You can filter on date range, staff, and signature status. Once your filters are set click, Run Report. Once you find the note with the missing signature that you wish to sign you can click, "View Note." This will take you to the note to sign.